The Hunger Project-Bangladesh is implementing a project titled ‘Empowering Youth Champions for Increasing Tolerance and Social Harmony’ in 9 Unions (Nirmoil, Dibar, Akbarpur, Matindor, Krisnopur, Patichara, Patnitola, Amair&Shihara) of PatnitalaUpazila under Naogaon District of Rajshahi Division from this January, 2017 which is funded by Canada Fund for Local Initiatives (CFLI) of High Commission of Canada, Dhaka, Bangladesh. The objective of the project is to empower a group of youth champions for promoting social harmony and tolerance in the targeted areas. 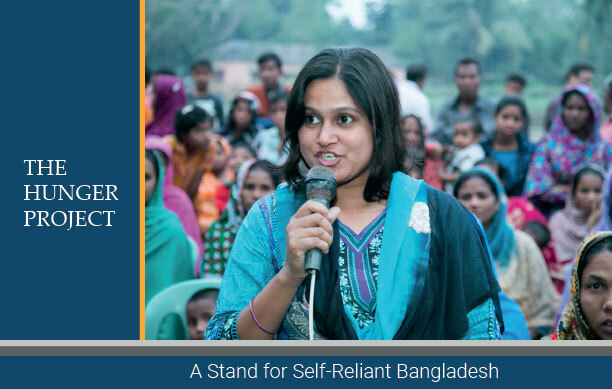 With this objective in mind, the project is intended to empower a group of young people with training and guidance to champion the cause of social harmony and pluralism in nine Unions of PatnitolaUpazila of Naogaon District. The project has already organized 27 half-day workshops on Vision, Commitment and Action at ward level in 9 Unions in order to identify the potential youths for promoting and protecting diversity and tolerance in the society. A total of 678 youths were sensitized and motivated to increase social harmony and tolerance towards minority groups in their community. The project has also trained 130 potential youths for creating cadre of Youth Champions to promote social harmony and enhanced their ability to be engaged in their communities. The participants were sensitized, highly motivated and committed after receiving the training to build peace, social harmony and diversity surrounding them and in their locality. The youth participants were well equipped with leadership, community engagement and social inclusion skills to promote tolerance and pluralism through the training. They have given their commitment that they will take the responsibility to arrange Social Harmony and Diversity Workshops at Ward levels in their community. The project is planning to organize a 3-hour long Social Harmony and Diversity workshops as part of sensitizing the wider community to promote tolerance and pluralism, which is being implementing in this February, 2017 in each Ward with approximately 20 community participants. In these workshops, participants will be engaged in discussion on the importance of social harmony and tolerance as means of protecting youths from radicalization. Through these workshops, the project will engage local political leaders, social leaders and other vulnerable, resistant and victim groups to promote diversity and pluralism. A day-long workshop will also be held with elected Union Parishad body, local civil society groups, political leaders, religious leaders and minority representatives. These workshops will sensitize 180 participants on the importance of pluralism, diversity and social harmony. After the workshop, the participants will be able to play the role of watchdogs for protecting and promoting diversity and increase tolerance. The project will end at 28 February, 2017.